For a couple of months now, I’ve noticed my cat has been trying to scratch her lower back every now and then but can’t reach due the location which is around her spine around 6 inches up from her tail. There's an area of about 3 inches long and maybe 1 inch deep where I finally got a fairly good look recently and noticed that there are small patches of fur missing so I can see the skin and I see small reddish to blackish flecks on the skin. They don’t seem to be protruding and are a little bigger in size than sesame seeds. I also saw some small white bumps (warts?) interspersed within the flecks and when I say white they're the same colour as her skin. The white skin seems a little scaly but it’s hard to tell. Otherwise, she’s eating well, enjoys me petting her (except that area) and purrs contentedly as usual and everything else is the same. I wonder if it's just a rash or what? I would love to see a photo of what you are describing about your cat. Is there any way you could take one and send it to photos@askavetquestion.com? If not, that's ok. I can still give you my thoughts without seeing the photo. Yes, that's a great idea to send a photo. I tried last night but the lighting and cat not cooperating made it hard so I tried this morning and got a few snaps but they're not great. I'm at work today so I'll try again after work and send the best I have. Thanks for trying Corinne. I've included your photo here, but you're right...it's pretty blurry. So to summarize, Bubelah has some spots on her skin that are on her lower back about six inches up from her tail. There is some fur missing and the spots are about the size of sesame seeds. They're not raised. 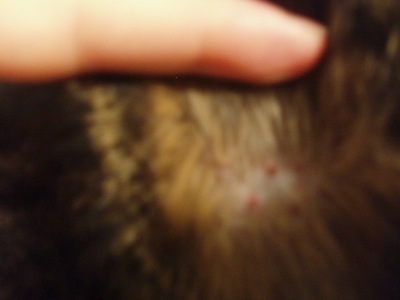 There are reddish black flecks on the skin and some white bumps. The first thing that I will say is that by far the most common reason for any skin problem in this area is an allergy to fleas. Quite often when I say this people will tell me that they are positive that their cat could not have fleas. 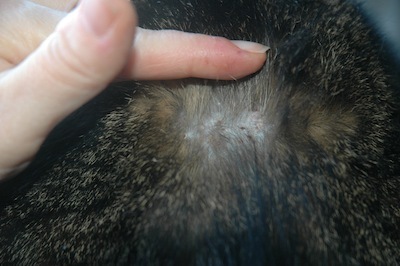 Some cats, however, are so sensitive to fleas that even one flea bite can set them off with skin irritation. Even indoor cats can get fleas as you can bring them into your house on your pantleg. Do the reddish black flecks come off at all? If so, try taking them and putting them on a paper towel and then putting a few drops of water on them. Can you smear them to make a rusty colored line? If so then this means these are flea dirt. If you think fleas are a possibility then I would recommend getting a prescription strength flea product from your vet and using it on Bubelah monthly for at least 3 months. You will also need to treat any other cats or dogs that are in the house. The next possibility is that this is some other type of allergy. If so, then it is usually almost impossible to find out what is causing the allergy. 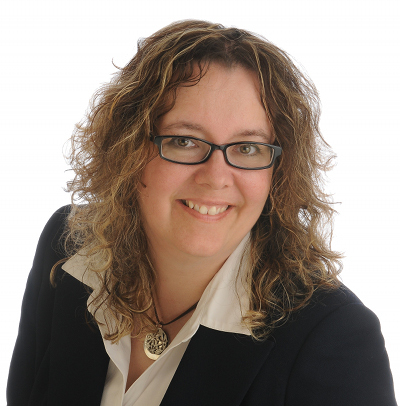 Food allergies are possible but very hard to diagnose. It's also possible that she has had some sort of an injury and is healing. 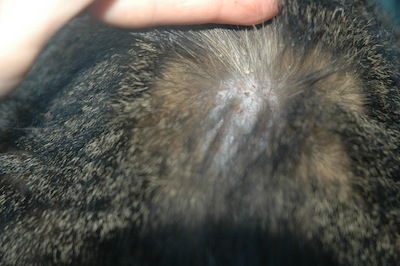 I have seen cats have unusual red spots and baldness like this after having a cat scratch or bite that is healing. At this point, if you don't think that this is due to fleas then I would likely recommend just keeping an eye on her and seeing what happens. If the area is itchy or is getting larger then she will need to be seen by a vet to see if she needs antibiotics or treatments for allergy. There is a chance, though that it just may get better on its own. It could take a few weeks to do so. There really is nothing that I would recommend doing or putting on it at home. Thank you for this information and advice. I tried to take a bit of the "dirt" off but it wouldn't come off. I don't know if I tried hard enough or if it's just doesn't come off. But I felt the skin for the first time and it felt dry, hard and bumpy. I've asked a friend if I could borrow his camera to see if I could get a better picture. I could get it from him early tomorrow morning. If it turns out clear and effective, would it okay to send it to you tomorrow morning? If it doesn't turn out, I think I'll have to take her in person. If it doesn't come off then it's not flea dirt. Flea dirt kind of looks like black flecks of dandruff. That's a great idea to get a better camera. If you know someone with an iphone they take GREAT closeup photos of pets. Once you get another photo email it to me and then reply to your question again so I get a notification. I tried to take it off but it seems like it was stuck on the skin. Too bad, I was hoping it was fleas! Okay, I'll get that picture and send it ASAP. Thanks so much! Sorry for the delay in getting a picture. My friend's camera didn't work well so I borrowed my sister's camera, picked it up at her work then brought it back to download and now have the results. I hope they're helpful. I posted the two best in the email hoping that would give you a better idea. Now we're talking! These are much better pictures! The answer is still pretty much the same as above though. This looks like something is irritating the skin. It could be an allergy to something or could be a mild wound. I'm guessing, because of the location that flea allergy is most likely even if you aren't seeing fleas. Again, if it is getting better then I'd leave it. But if you're not seeing improvement in say, a week, I'd have the vet take a look. Okay, thank you very much for your help! You've been very helpful.